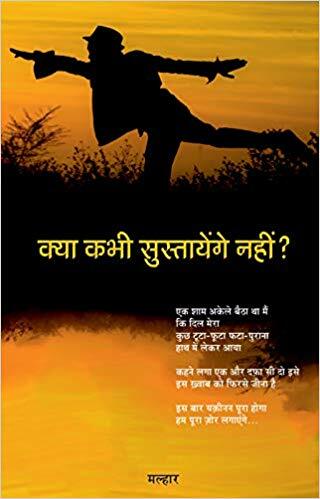 New Book Release: Kya Kabhi Sustayenge Nahin ? These poems included in this poetry collection leave no doubt in the readers minds that the poetic thought and style are full of an indestructible unity. These poems included in this poetry collection leave no doubt in the readers minds that the poetic thought and style are full of an indestructible unity. The poetic thought in these poems is never out of date and quite appealing to all readers. These poems show extraordinary and eloquent phrases. Really very creative poems. I am Malhaar. I am from Madhya Pradesh (Katni), because of the upbringing by my parents I have an interest in religion and believe in God. After giving 6 years to the Indian Army, I stopped the service of the country & turned towards Art. I have done a film-making course & theatre from Delhi and came to Mumbai. I enjoy writing poems, songs, stories & screenplays. I call myself a writer, not because I write few things but because I find myself into a situation - where I receive something from unknown. Something wants to get out through me. I am the chosen one for this, like other's out there.